Beginner Level SUP Classes for First Timers, Let’s Have Fun! 1. Learn all the fundamentals of SUP safety while paddle boarding, as well as extensive description of the SUP equipment from a true board designer/shaper. 2. In this class you will learn all the fundamentals and techniques of Paddle Boarding such as proper stroke and paddle grip, stance and positioning on board, proper posture while paddling, how to turn and control your direction, and much more. 3. We start with a 30 minute clinic on the beach, then we launch you safely into the water and start working on the basics. Before you know it your up and paddling, and enjoying the spectacular surroundings of Mal Pais and the Cabo Blanco Nature Reserve just to the South. There’s no better way to experience this area than this, while at the same time learning this great sport. Intermediate Level SUP Classes “I wanna try some wave riding”!! For SUP Wave riders out there who have a good handle on riding waves back home, come and let us show you around the area, we will take you to just the right breaks on any given day. With our 17 years surfing experience on the Nicoya Peninsula, we can guide you better than any one else in the area. 1. The plan is to take you to different breaks through out your stay here. 3. We will take clients to breaks where there are no other surfers or paddle boarders around. 4. We will SUP Wave Ride outer reefs, point breaks, beach breaks, and get to know reef passes. 5. Work on SUP wave riding techniques, style, posture, wave approach and lining up at each break. 6. Learn about the area, and it’s history while touring the various beaches. Advanced SUP Wave Riding Tours and Clinics. We have gotten many clients into their first waves, and know the right approach in teaching wave riding skills at just the right pace. 1. We will take you out in conducive conditions for catching your first waves. 3. Learn about the history of the Nicoya Peninsula, and see the surrounding area You’ll receive guided tours over the clear waters of Mal Pais and warm sandy beaches of Santa Teresa. Costa Rica Stand Up Paddle Board Rentals. Rent a SUP in Santa Teresa for a session, a day, or for your entire trip. Freedom Riding SUP in Costa Rica has a variety of different size Stand Up Paddle boards for all levels of experience. 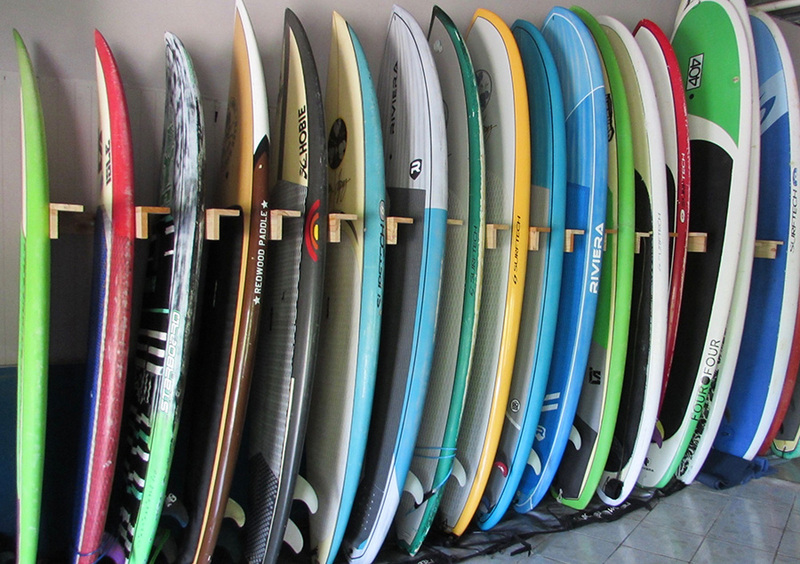 Our rentals include the most stable and easy style boards for touring, and also a wonderful selection of wave riders, from sizes 7’10 up to 11’0 (Check pictures of the selection). There is no limit to the amount of times you can exchange your board within your rental period, which is always a great option since the waves and conditions change rapidly in Mal Pais/Santa Teresa. Contact us today to reserve a board, or boards. Freedom Riding SUP Costa Rica is Mal Pais premier SUP Tour Company. We cater to all levels of Paddle Boarders, and help clients who are interested in coming to the Mal Pais/Santa Teresa area learn or train on an SUP Board. Our main SUP Tour is the Cabo Blanco Nature Reserve. We are on the border of the reserve, at the end of the road in Mal Pais. There couldn’t be a more exciting and exhilarating place to paddle, the views inside the reserve are incredible. We can paddle up to five miles into the reserve, depending on your skill level and physical ability. Even a short paddle into the Reserve is breath taking. Just a half mile into the Reserve you will see the Tip of the Peninsula which features the “Cabo Blanco Island”, which can only be seen by water, not from land. Paddle boarding in the the famous Cabo Blanco Nature Reserve is an experience you won’t soon forget. It is one of the most fascinating coast lines in all of Costa Rica. It has a rich history. There’s no better way to experience the reserve than on a paddle board. We will educate you about the history of the reserve and anything else you would like to know about the area. WELCOME TO FREEDOM RIDING SUP, COSTA RICA! The Nicoya Peninsula is filled with a variety of great surf breaks for all levels. If you’re an intermediate or advanced SUP wave rider, and want to enjoy the perfect and uncrowded waves on the Nicoya Peninsula, come and visit us!! With over 20 years surfing experience in the area, we’ll take you to the best and most uncrowded breaks in the area, and help you work on your game!! Here on the Nicoya Peninsula, we are blessed with consistent waves year round, and a variety of surf breaks to choose from. On any given day you can score fun waves. We have a wide variety of breaks as well, from peaky beach breaks, fun little reefs, out reefs all over the place, some point breaks, and a few reef passes as well. We have a West Side, and an East Side to the Peninsula, and when the wind is howling onshore on one side, it’s offshore and clean on the other. With our 18 years experience surfing in Mal Pais/Santa Teresa, and all over the Peninsula, we will get you into the best waves on any given day. We also have quite a few secret spots left around the area— tricks up our sleeves. • Transportation to and from the different SUP outing locations each day of the retreat. • Bottled water at every SUP Outing, and also Fruit on the longer SUP adventures. Package rates include:Your choice of garden or luxury accommodations, awesome breakfast, and all transportation for SUPing and for your other chosen included activities. Each package also includes unlimited use of a SUP board, paddle, leash and rash guard, SUP Instructor/Guide, SUP lessons, coaching and guided tours, daily Yoga instruction in or outside the water, other activities and much more. *Bring your family or friends for a discounted thruster or quad rate. Check out our rates below and RESERVE TODAY!!! All prices are per person and do not include airfare. *Luxury Accommodations Available for an Additional $75 per night.